Italian dishes, specially pasta different presentations and flavors, will always be an excellent option to enjoy exquisite recipes. Raviolis are a kind of pad (usually square), made of edible pasta, and filled with varied ingredients, they are cooked in boiling liquids, such as broth, sauces or water, and accompanied by sauces, creams or vegetables, that make them irresistible. In this opportunity we bring you a delicious recipe where we enhance the raviolis character, and we do it using the magnificent and aromatic garlic flavor, and the colorful spinach pleasant texture. Prepare them and you will see the can surprise you. Put in a cooking pot 8 cups of water on medium-high heat. When it boils add the raviolis and cook until al dente. Drain the water from the ravioli, add a tablespoon of vegetable oil to prevent them from sticking together. Retire the raviolis from heat and preserve. Wash the spinach and coriander leaves very well; drain excess water and cut into small pieces. Put now a frying pan on medium heat and proceed to pour the oil, add the butter and garlic, until butter melts and begins to boil, it takes about 1 minute. Now add the red pepper, salt and pepper to taste. Add all the ingredients mixing with a rubber spatula. Add half of the raviolis and stir until all raviolis are well covered. Add the rest of the raviolis and stir. Cook for about 5 minutes or until the raviolis are golden. Flip the raviolis if needed in order to prevent adhering. Continue stirring gently taking care not to break the ravioli. Stir until all the ravioli have spinach. Finally add spinach and coriander. 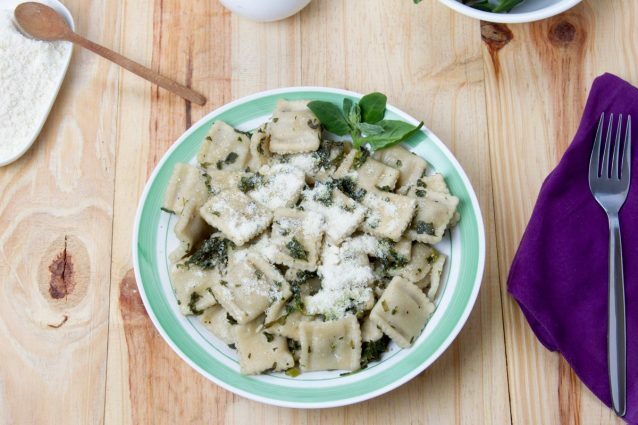 Decorate everything with parsley and parmesan cheese. Serve immediately.